Westwood Shores offers a wide variety of activities for its guests to do right here at the resort. With the warmer weather in the summer, guests can enjoy our outdoor swimming pool or venture out on the water on our complimentary paddle boats. 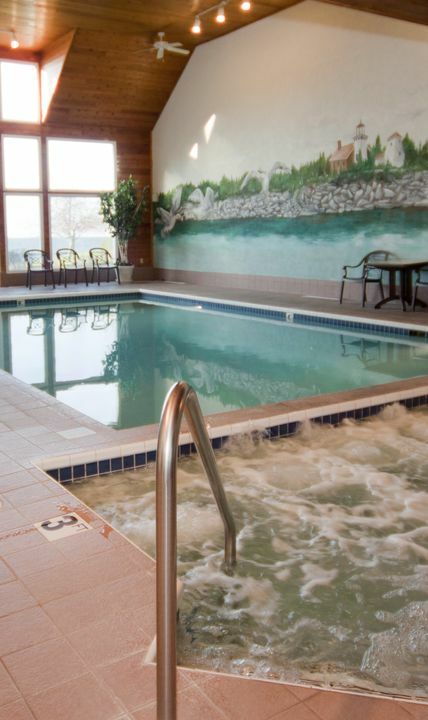 Guests also enjoy our indoor pool area which also features a whirlpool and sauna, all year long! We have a complete fitness room with weights and maps, a TV and water cooler. Enjoy a glass of wine along the waterfront as you watch the sunset. We offer 24/7 coffee, hot chocolate and tea in our parlor area. There is also a TV, a computer and plenty of places to sit while you look over the area information and local menu's we provide. You can choose to spend the day enjoying one of the fantastic amenities we have to offer, or just relax and do nothing at all.